Torrential rain and snowfall blanketed much of Lebanon this winter, affecting thousands and thousands of Syrian refugees currently living in refugee camps along the border. Imagine if you lived in a tent or make-shift shelter with no heating and that same cold front blew through your city. Or worse, the snow and rain destroyed your shelter altogether. This is what happened to thousands of Syrian refugees in Lebanon. 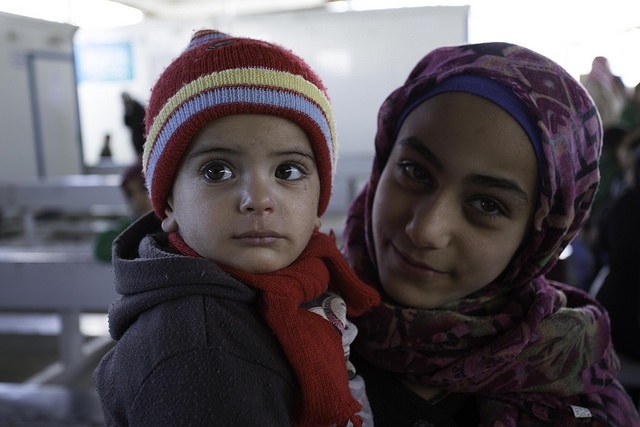 This winter has proven to be one of the toughest for families displaced inside Syria and seeking refuge in Lebanon. Women and children need your help today. It's hard to imagine what these refugees have endured. Having survived a brutal war, dangerous weather now threatens basic living conditions and overall health. MAP is working with partners on the ground to respond to this crisis, but we need your immediate help. MAP is working with our local partners on the ground, Syrian American Medical Society and American Near East Refugee Aid (ANERA) to distribute critical medicines and health supplies at hospitals and clinics in the region. MAP airlifted an Interagency Emergency Health Kit (IEHK) in December to serve the medical needs of 10,000 people for three months. We need your help immediately to continue support for women and families who have already suffered the unimaginable. Our partners have already requested another IEHK to help refugees living in despair in Lebanon. Will you help us provide additional assistance to these innocent women and children? Imagine being forced to flee everything you've known, you and your very young children, leaving your home just to stay alive. Could you face winter in a refugee camp? How would you keep your children warm with only a canvass tent between you and the bitter cold? This is reality for mothers like Amira. She was pregnant with her fourth child when the situation became too dangerous in her Syrian village. She and her husband made the difficult decision to pack up what they could and try to find a safer place for their young children. Soon they discovered that no place in Syria was safe, so they fled to the Jordanian border. When the family finally reached the border, Amira’s brave husband sent them to safety but went back to help others. It was the last time Amira saw him. Soon after, she went into labor and was helped by a Jordanian medic who delivered her baby—several weeks too early. Although Amira and her children were finally safe, they had nowhere to go and her newborn baby was not well. The refugee camp was already full. A Jordanian family took pity on her and offered her a room with no heat for the family to use. Others donated some sleeping mats and old blankets. When we met them, Amira and her children were all sick. They had respiratory infections and the baby had a rash that makes her whimper in pain. The infant was underweight and sickly. They had little to eat and relied on a local church to bring them food and supplies when they could. A nurse came to check on the family while we waited with them. She promised to bring medicine—as soon as it is available. Amira is only 28 but she looked so much older. “We escaped the war in Syria, but what now?” she said. “My children and I are barely existing. We are all sick. We need help. I don’t know how much longer we can go on like this." Because of friends like you, we were able to provide medicine to Amira and her family—and many others. As you read about Amira, consider how many others wait in these camps. Give today, so a child can be saved tomorrow. Please use the white arrows below to complete the donation process. If you would like to send us a message or honor someone with your gift, please check the 'comment' box and enter your special note.